> Blue Funboard 7' 2"
The Funboard is a great board for people who want a board that they can ride and allow their surfing to grow into the board. By this we mean that the Funboard will get you up and surfing for sure but if you want to push it, it will stand up and perform. It has a fair amount of nose rocker to help it paddle easily and is wide enough to float you well. 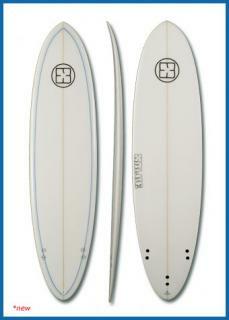 BLUE Has simplified the cosmetic design and logo treatment to give the boards a fresh tribal look. All boards are glassed with a 1 x 6oz and 1 x 4oz deck and 1 x 4oz bottom with a patch on the fin area. We give the boards a gloss finish and they come standard with FCS M5 fins.